Three and a half years ago, Volodymyr Zelensky's television series Servant of the People began airing on Ukrainian television. For a country where money and powerful oligarchs have long dominated politics, the concept was beguiling. 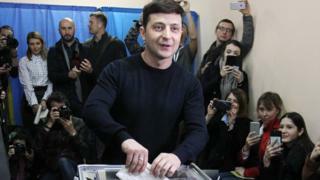 A teacher (played by Mr Zelensky) accidentally becomes president after an expletive-laden rant about Ukrainian politics goes viral on social media. Now after victory in the first round, Mr Zelensky is one step away from the real deal. Is life imitating art? Or could we be witnessing a sophisticated, very 21st-Century election heist? Mr Zelensky's entire election campaign has been based on being different and defying convention. So there have been no official rallies or political speeches, and lots of cheerful videos on social media. The 41-year-old has made his ignorance a virtue and openly admits to having no strong political views. "No promises, no disappointment" is one of the few memorable things he's said. At the end of January I spent a day with Mr Zelensky as he submitted his registration papers for the presidential election. He's an actor by profession, so it could of course all be fake, but my overwhelming impression was that, just like on television, he's a likeable, fun guy. As he showed me around the corridors of his highly successful production company Kvartal 95, Mr Zelensky joked with me about how he liked Monty Python, before lamenting that the audience for his TV shows are more into the slapstick "Benny Hill"-type humour. When we moved into the staff canteen for a more serious interview, it was immediately clear that Mr Zelensky's political views were still very much a work in progress. He told me that he believed people wanted "something new, they want to get a person with a human face". There were vague commitments to "stop the shooting" in eastern Ukraine, but a jumble of ideas of how to do it. Ukrainian emigration was another big issue, he told me, but there were no immediate ideas on how to stop the brain drain. Things didn't get any better when I turned to Mr Zelensky's Achilles heel: his business ties to Ukraine's most controversial oligarch, Ihor Kolomoisky. The links are there for all to see. All the comedian's TV shows are on one of Ukraine's most popular TV channels 1+1. Mr Kolomoisky is the owner of 1+1, but he has to manage it remotely from self-imposed exile because there are numerous investigations in Ukraine into his business dealings. When I spoke to Mr Kolomoisky in Israel, he did little to play down his role in the actor's rise, gushing that he wished there were "millions of Zelenskys". And there's no doubt that 1+1 has given its full backing to the comedian. Four days before the vote, the latest series of Servant of the People premiered, and on the night before the election a full evening was dedicated to Mr Zelensky's back catalogue. The question then is what, if anything, a President Zelensky would give back in return. When we spoke, the comedian insisted he was "no puppet" of Mr Kolomoisky and said that if courts found against the oligarch, he would receive no protection. But the worries linger. In the last few weeks, after some disastrous performances in closed-door briefings with diplomats, he has brought on board advisers with credibility to try and reassure people that, even if he may appear clueless, he'll be surrounded by smart people and getting the best advice. 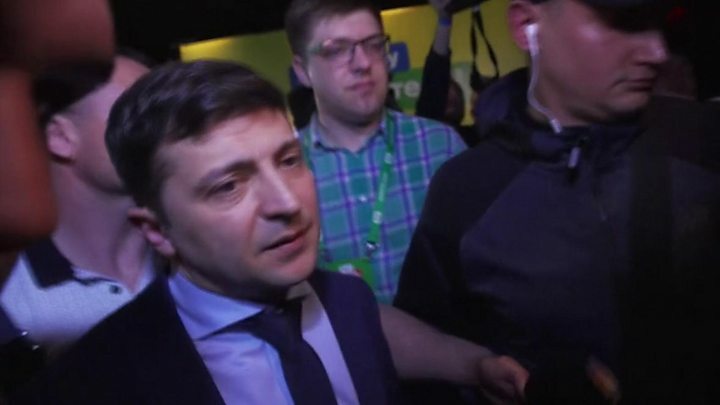 For now, Mr Zelensky must focus on the second round in three weeks' time. 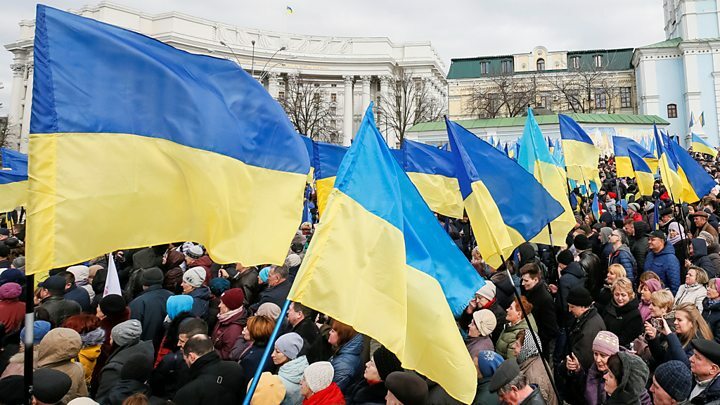 His likely opponent Petro Poroshenko has a more established network on the ground and the support of administrators across the country. Victory for the comedian is by no means a certainty.